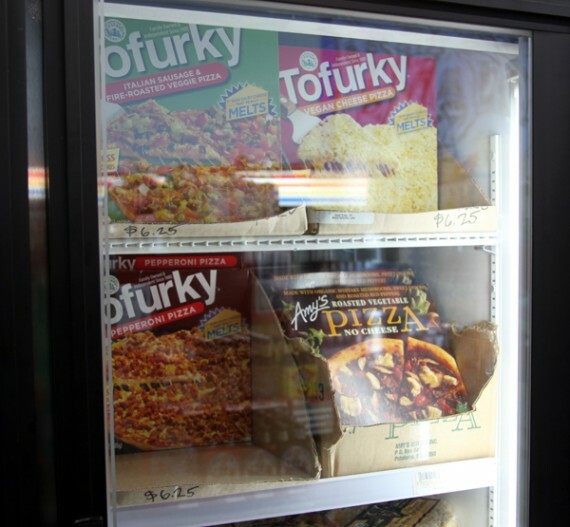 when i tried the new tofurky frozen pizza at natural products expo west a few months ago, it was seriously love at first bite. covered in stretchy daiya cheese and plump pepperoni bits, it was the best frozen pizza i’d ever tasted. imagine my excitement then, when i got a letter from tofurky advertising their new pizza line, along with a coupon to get one for free. the only problem is, i couldn’t find a store in LA selling the pizzas yet. i had no choice but to hop on a plane and head up to the cutting edge food fight grocery in portland, oregon. of course, food fight is so awesome, they had all 3 varieties of pizza in stock. it was difficult to choose, but i finally went with pepperoni because i loved it so much when i tried it at the expo. pizza in hand, we left portland and headed back to los angeles. the food survived the flight surprisingly well, and we popped it in the oven the minute we got home. 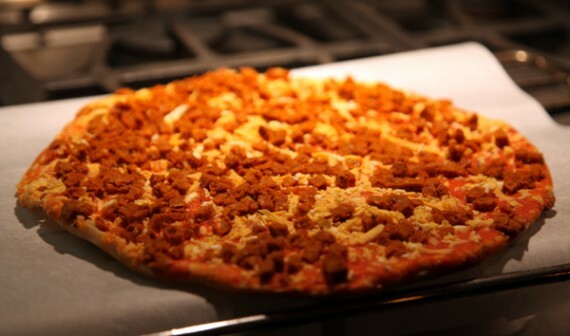 lemme just tell you, this new tofurky pizza is ABSOLUTELY AMAZING. it takes me back to the days of being a vegetarian when frozen pizza was readily available for a quick dinner or an indulgent snack. omg omg OMG so tasty. no words. the daiya melts beautifully in the oven and produces the perfect amount of “stretch,” and the hearty tofurky topping is perfectly meaty. everything about this pizza rules. 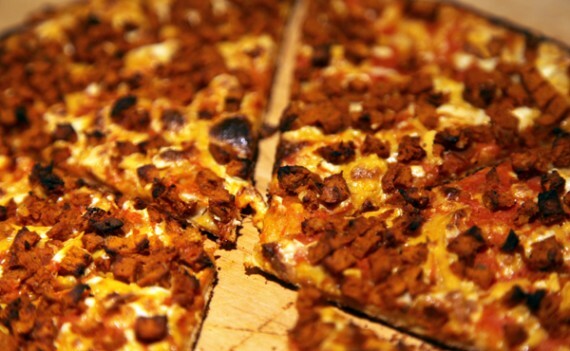 i honestly cannot WAIT for these little pizzas become available in LA. bug your local whole foods to start stocking these, because they are seriously game-changingly delicious. according to tofurky’s facebook page, these pizzas will be available at ralphs in southern california starting JUNE 12th! oh yes, you best believe i will be lining up outside for that shiz. What’s the price range on these beauties? i think this one was $6.25! look at Ralph’s ahead of Whole Foods and Trader Joes on this one. cant wait. btw, why does TJ’s carry so many meatless but not vegan items? These sound amazing..I’ll def. be on the hunt. 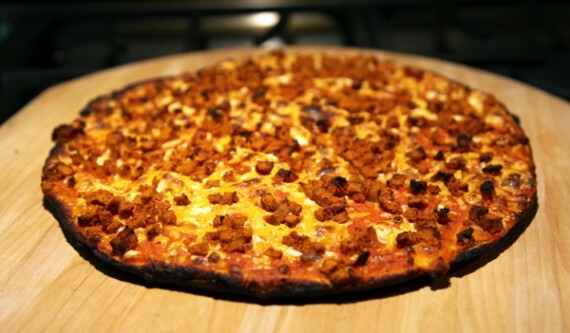 Although, I have 3 of those cheeseless amy’s pizzas in my freezer right now and they are SO good! I was devastated when TJ’s stopped carrying the Amy’s no-cheese roasted veggie pizza. Such a blow. TJ’s is not really a health food store by any means – they’re pretty clear about being a specialty grocery store, driven by consumer demand. They get super cheap deals on particular products and manufacturers get huuuuge contracts with them. Most of their products are private label, which means lots of secrecy behind their sources and who the actual manufacturers are. In cases like the Amy’s pizzas it’s pretty obvious who makes it for them since the boxes are the same and all. I worked there for a while and it was surprisingly lacking in vegan options for lunch. I got sick of eating the same wraps and burritos for four years.They do have a nice handful of vegan products at really incredible prices (Soyrizo for $1.99!! ), but I can never ever get all my shopping done in one trip there. Aaaaanyway, yeah, these pizzas are pretty incredible. I would like to see one with veggies…but there really is nothing like them on the market. Good for Tofurky! wooohooo! I’m counting down the days. but who cares? I bet they all taste like amazing! Thanks QG!! Looking forward to trying these soon. I can’t wait till this comes to our town. . .
andy: according to the tofurky website, there are three servings per pizza! This sounds yummy! I am going to ask my local store Figueroa Produce to please bring these to Highland Park. They are always asking me for new vegan/vegetarian product ideas. They now sell the Daiya Cheddar by the pound! Food Fight rocks! And so does that pizza. Have a blast in PDX – can’t wait to hear about it. Holy crap! One pizza is 720 calories…240 calories a serving. They do look yum though. 720 calories.Pshhht, I bet I’ll have to run, jump, kick, and roll to get to a Ralphs and be able to find these pizzas. Not to mention the backflips and cartwheels I’ll be doing after from the exittement. No worries. omfg southern california better include the valley,because this vegan right here in the 818 needs to find these in ralphs! I’m so excited..and to lisa..I’m sure they’ll have it. For sure sherman oaks or tarzana. (I used to live in the valley). I wasn’t a huge fan of amys roasted bcuz I don’t see the purpose of having a pizza without cheese..but that’s jus me being weird. I’m veery excited. Vegan food has come a long way. You’ll have to fight me for them, Lisa…I’m gonna eat ’em all! BWHAHAHA!!!! I was just in Portland Saturday through Tuesday (June 1st) visiting from Bellingham. I went into Food Fight and was going to get those but I had no place to bake it. (sigh) Can’t wait till we get them in Bellingham though! i LOVE low-quality nasty frozen pizzas. seriously i used to eat those $1 pizzas all of the time before i went vegan. I WANT! Man, flying to Portland just to buy a lousy pizza? Are you some millionaire or something? 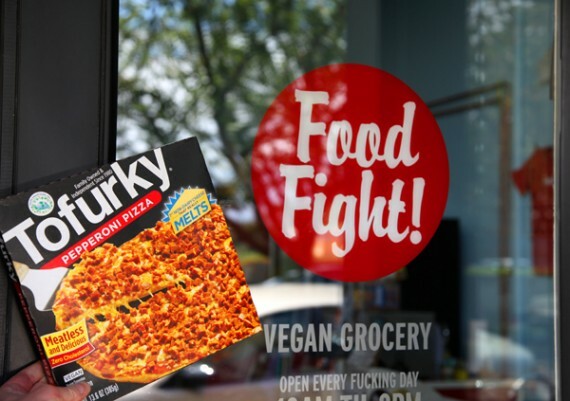 I found the Tofurky pizzas at the VP Health food store on Edinburgh and Beverly Blvd. in West Hollywood. And they’re both under $5! I found these in Ralph’s on Pico and LaCienega in LA for $8.79…kinda spendy, but for some reason I get more excited seeing these kinds of products in a mainstream store than i do when I see them in the expected places (Locali, etc). Mine is in the oven now! It was $5.95 at my local food coop. We got the one with veggies and sausage. It was awesome!